A new gem has taken its place in the architectural playground that is Salford Quays in Manchester. Between the towers of MediaCityUK and Michael Wilford’s The Lowry, sits a small but perfectly formed gold parcel – a new home for The Alchemist, an innovative cocktail bar and restaurant which will open at the end of August 2017. 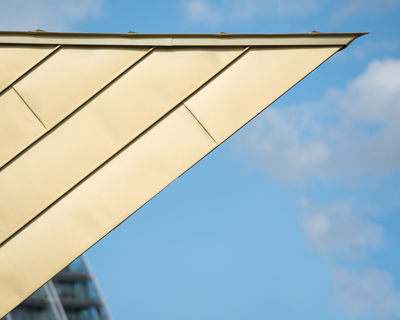 We spoke to its architect, Marion Room of Reid Architects and Paul Smith, MD of Longworth whose team installed the stunning folded gold roof and walls. The bund is a transitional space where pedestrians cross between Media City and the Lowry. MediaCityUK developers Peel Land and Property Group commissioned Reid Architects to create a design icon that would be a beacon linking both sites and provide an oasis for walkers between the two. Reid Architects started discussions with the planners before there was an anchor tenant. “It was clear we would need to maintain several significant views across the site, and that the roof would be as important as the walls because so many people look down on it,” said Marion Room. The building is therefore all elevation, with a roadside main entrance and a cantilevered terrace looking out over the Manchester Ship Canal. The team at Reid Architects began experimenting with cutting away the geometry in plan, but to address all the site constraints the design ‘became a wrapped object, like a piece of origami’. The service yard is tucked away under a folded end with a fire escape, and there are very few penetrations through the envelope – plant is housed in the ceiling and louvres at each end under overhanging eaves mask all the services. It was at this point that Longworth and SIG Zinc & Copper became involved. Paul Smith describes their first encounter with the building as ‘a folded piece of cardboard’, which might seem daunting, but early involvement is always an advantage. “The sooner we are involved in a project, the more time and money we can save the client,” he says. The roof has multiple falls against each other at low pitch, which would be too shallow to form an effective valley gutter, and water would be trapped behind the standing seams. Longworth established a set of falls that would meet the design intent, but also allow water to evacuate quickly. This included creating slopes which pitched in two directions, which they tested with a bucket of coloured water – “just to be sure it would work,” explains Smith. The choice of metal cladding exactly suited the precise geometry of the building form, and zinc on all surfaces hit the brief for visual quality for all angles – including the roof. The team explored colours other than traditional grey, to enhance the beacon qualities required, but when Living Ventures (owners of the brand) saw the gold version, it fixed immediately as the right choice. What could be more appropriate for Alchemy than gold? The finished building is clad in elZinc Rainbow Gold Protect over an Admaster composite panel which provides both insulation and acoustic attenuation – quite important for a bar in a mixed-use area. Longworth designed the deck with a thicker Admaster panel to ensure the design met the sound attenuation requirements of the project. Zinc in the roof areas is 0.7mm and 0.8mm on the walls. The standing seams are at 430mm centres which allowed no waste from a 1m wide roll of the product. Reid Architects originally specified KME Tecu Gold as the cladding, a copper alloy also supplied by SIG Zinc & Copper. The choice of elZinc Rainbow Gold Protect was made as the design team understood that the material will remain stable and won’t weather as heavily as the alternatives and would be best suited for this project on this site. Zinc also has other benefits for this project. Room explains that because the roof cantilevers out over the canal, zinc’s zero maintenance qualities are ideal. “We’ve designed all the water to fall back to the pavement side, outside the thermal envelope, with telltale drips in the overhanging eaves. This allows maintenance almost entirely from ground level – a very good Health & Safety solution”. elZinc Rainbow is a good product to work with, says Smith. “It’s a very malleable zinc and doesn’t split or mark particularly easily.” Architect Marion Room was very impressed with the installation process. Smith also recommends early involvement. “Get us involved as early as possible – the sooner the team is involved, the more advice, help and assistance we can bring. In every instance, we have been able to save the client money and time. We can help redesign not just the zinc but the whole construction to get the best results – but can only do this if we’re involved early enough.” Involving specialist contractors and suppliers early really does make sense. But it isn’t just the tenant who loves the building. Members of the public and TV workers were tweeting photographs as the gold was revealed in all its glory. “We are looking forward to visiting the building once it is fully occupied at the end of August”, said Room. We are the team at SIG Zinc & Copper. 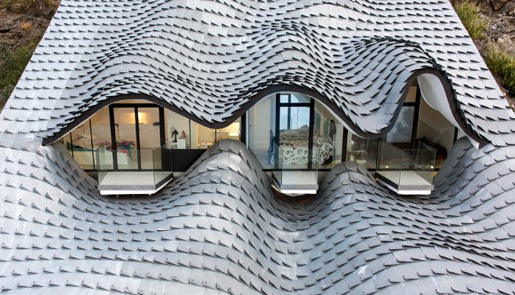 We design and supply zinc, copper, aluminium and stainless steel roofing and cladding products all over the UK. We also publish blog posts! We're part of SIG Roofing. With over 120 branches nationwide, SIG Roofing is the largest supplier of roofing materials in the UK, providing our customers with impartial advice on the right roofing solution for their projects.